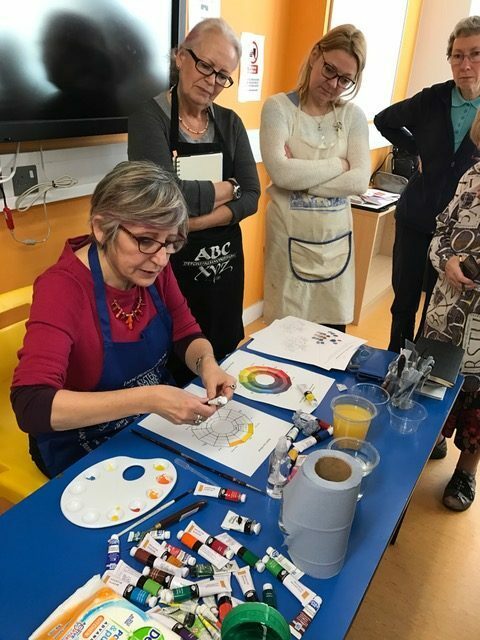 A dozen of us gathered at the Aspire Centre on a beautifully sunny day for Rosella’s workshop, which proved to be inspirational and totally absorbing. We began by filling in a colour wheel using one primary colour, then adding a little black to the original colour, then white and then grey. Then we repeated the exercise using secondary colours and so on. Along the way we learned about hues, tones, shades and tints. Lots of fun mixing colours and lots of cleaning “palettes”. In the afternoon we made up a “paint chart” taking two colours at the opposite side of the colour spectrum, and gradually adding a little bit more of one colour to the other until they met in the middle. We ended up with all the shades going from one colour to the other. Some surprises and some interesting results as we mixed different colours together. Rosella was quite concerned that we were so quiet but everyone was so absorbed in their work they did not spend time chatting. Everyone learned something and will no doubt be incorporating new found knowledge into their work in the future. As always, the workshop was over much too soon and it was time for a final palette cleaning. A great day – thank you Rosella!